The SSL AWS Truck TourOn tour near you in the USA in 2017! The SSL AWS Truck is built on a 2012 F550 Ford chassis with a custom body built by leading mobile vehicle specialist Shook Mobile Technology. 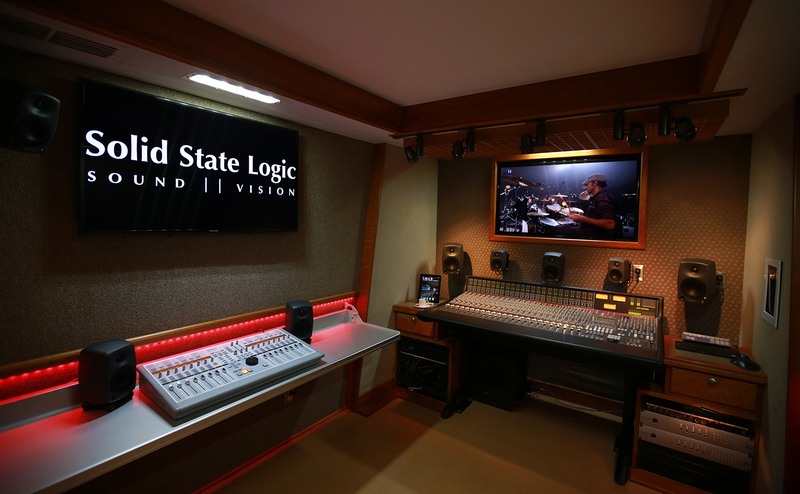 The main studio space is completely climate controlled, sound proofed and acoustically treated to provide a comfortable, accurate demonstration environment. 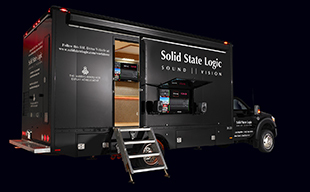 The vehicle can accommodate up to 5 individuals inside for a demonstration but with an external video display and audio monitoring linked to internal cameras can also accommodate larger groups outside the vehicle. The AWS 948 Delta is SSL's latest incarnation of the multi-award winning hybrid studio console/DAW controller that has set new standards of sonic excellence and workflow efficiency for mid scale professional studios worldwide. It is combined here with SSL's acclaimed Alpha-LinkI/O which provides pristine AD/DA conversion. SSL's new Nucleus 2 brings new studio minotoring and talkback facilities and Dante audio interfacing to the multi award-winning Nucleus DAW controller. 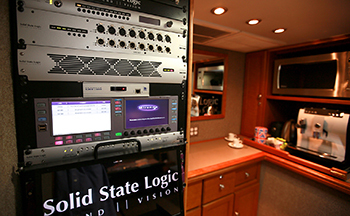 it is combined with SSL Network I/O products on the Truck as a system designed to demonstrate how a Dante network can be used to create a multi-student teaching lab where students can all gain access to audio assets/recordings simultaneously on individual workstations and enjoy efficient, streamlined teachning workflow. The audio monitoring system includes a 8020.LSE Espresso system, which consists of five Genelec 8020B two way, bi-amplified active monitors matched with a Genelec 7050B LSE™ Series Active Subwoofer. A pair of 6010A Bi-Amplified Active Monitors for PFL (pre-fade listen) and a pair of 8030ABi-Amplified Monitors for the outdoor display round out the system. Video Monitoring is handled by a Miranda Kaleido-X16 multi-viewer and signal processing is provided by Miranda's Densite range. Comms is handled by an integrated RTS Adam-M modular matrix system. All of the truck’s lighting and climate control is handled by a Savant True Image iPad interface.